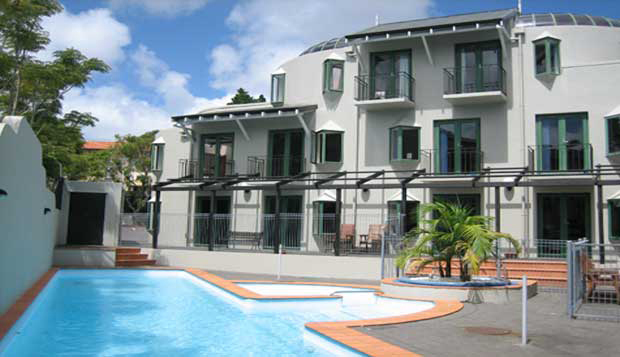 Situated only 1 minute walk from the beautiful sandy Takapuna Beach with its great views of Rangitoto.Parklane Motor Inn offers you motel accommodation just a short stroll to all of Takapuna's shops restaurants cafes and exciting nightspots. Your accommodation choice by the sea! Park Lane is a great place for a longer stay - we have a swimming pool, mini-gym & a sauna which has separate shower facitites. We also have a guest laundry, dry-cleaning service and free ample off-street car parking available. We have a Breakfast Room which serves breakfast in the morning. Our takapuna motel has a number of different type of studio rooms available to meet your specific needs, including Standard Studios, Twin-share Studios, Family Studios and Premium Spa Studios. We also have inter-connecting studios available on request. Every room has air conditioning, balcony, remote controlled colour TVs, refrigerators, tea & coffee making facilities, en-suites (Premium Spa studios with large spa baths), Wireless Broadband internet access is available in every room, electric blankets, iron and ironing boards, hairdryers, clock radios, mini-bars and plunger coffee. Microwaves, cots and highchairs are all available on request at no extra charge. And we are the closest motel to historic Devonport. You really do get it all at Durham Motor Inn - a quality 4 Star Qualmark property offering superb value for money, excellent customer service and spacious, comfortable rooms to suit everybody. We are set in attractive grounds and all rooms are on ground-floor level, with free off-street car parking. 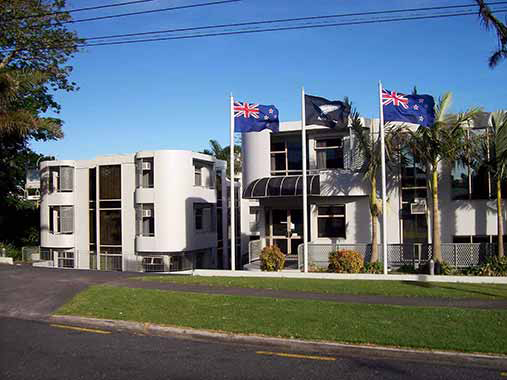 We are next to the courthouse and just behind Baycourt, just a short stroll to everything Tauranga City Centre has to offer, including restaurants, cafes, shops and the CBD. It makes sense just to leave the car in our car-park and walk everywhere! Stay with us, and you will appreciate why people come back again and again. It really is a home away from home!! Location, Location!!! Parklane has a great location directly opposite Auckland Showgrounds and Alexandra Raceway and we are the closest to Greenlane Medical Clinic. Cornwall Park is a short stroll away, great for that early morning walk or jog and Ellerslie just over 1km away. And we are the only local motel with a swimming pool and conference rooms. 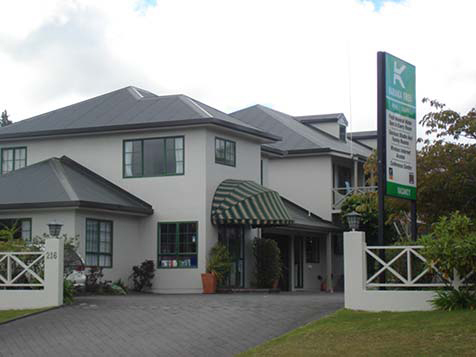 We are set in attractive grounds directly across the road from Lake Taupo with free car parking and is the only motel in Taupo with geothermal mineral freshwater hot pools in EVERY room. Enjoy the superb FRESH-WATER PRIVATE MINERAL HOT SPA POOL in EVERY room!! Featuring 24 spacious Spa Studios located upstairs and One Bedroom Spa Suites located on the ground floor. Every room is extremely spacious and the One Bedroom Spa Suite offers a separate bedroom and lounge area, as well as a private courtyard area with a fabulous geothermal mineral water hot spa pool and attractive outdoor table and chairs. The Spa Studio has a separate room with a geothermal mineral hot spa pool. If you would like more information please click the photo for the motel you are interested in. Or to book now chose your dates and location below and click the book now button.